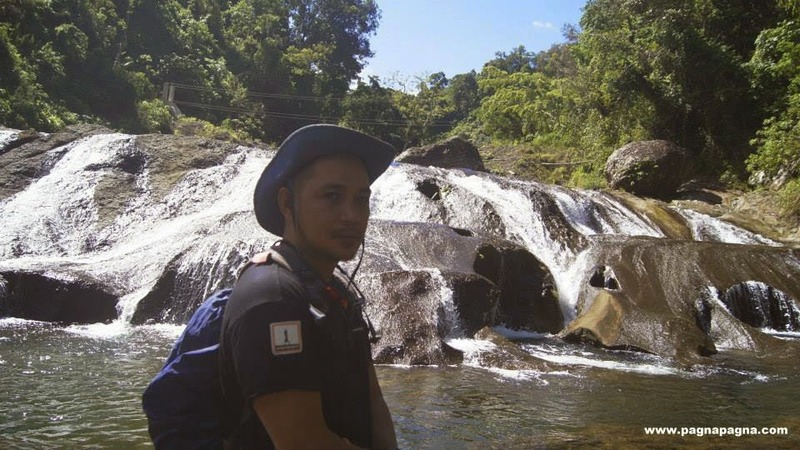 " Tili ti Nuang falls is a tributary that leads to Tangadan falls.We did not hiked the shortest distance from one to the other but for me, it was another personal feat"
The two of us arrived at downtown Bagulin at 5:57 in the morning through a tricycle ride from the bus stop at the Plaza of Naguilian, La Union. 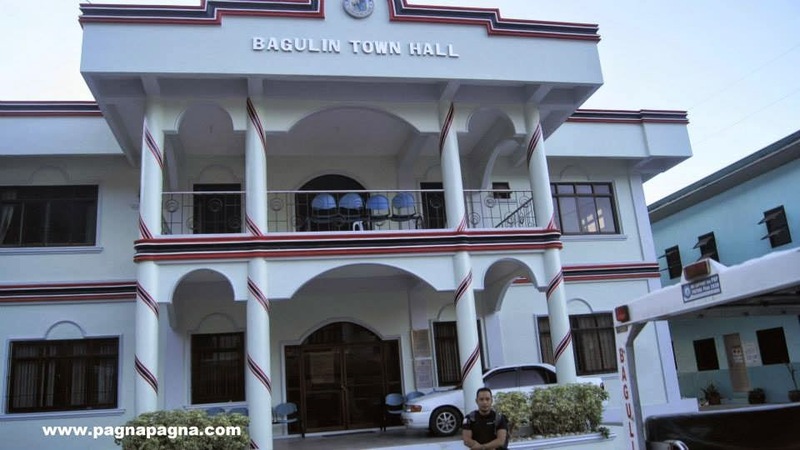 At Bagulin town proper, we were asked to log-in at the police station as the Municipal Hall had not yet opened at that time. There, we were welcomed by friendly policemen headed by Police Inspector Juanbe. They gave us the station's contact number just in case we needed it then they offered us some coffee. After which we thanked them and went on our way crossing the river through a hanging bridge to get us to the motorbike terminal area at the other side. 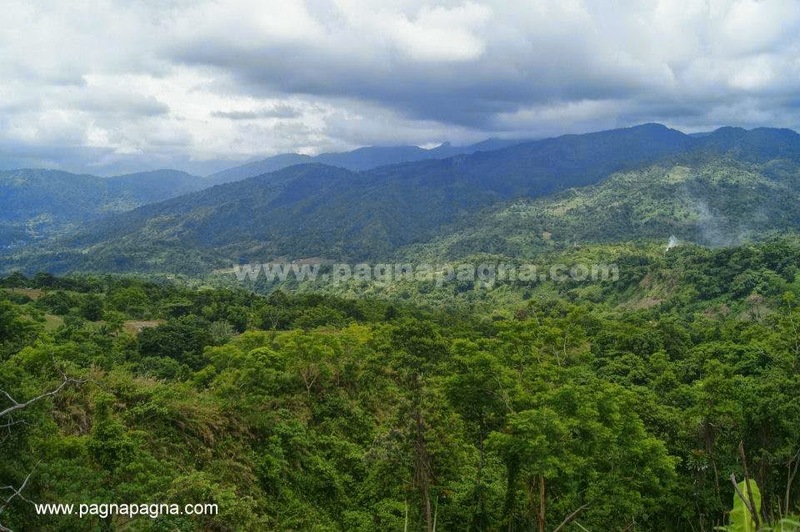 We rode a passenger motorbike going up to the mountain barangay of Cardiz (Upper). 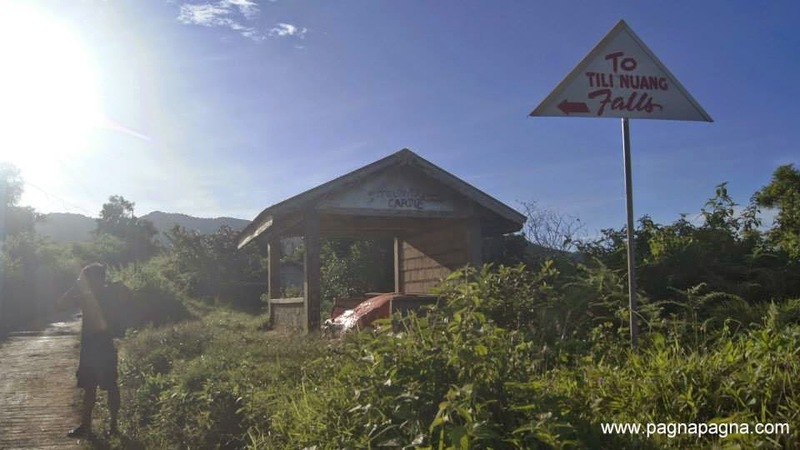 Arrived at the drop-off area at 6:45 am where a sign says "To Tili Nuang Falls". We paid the motorbike driver and started walking along a dirt road going down from the main road. Until we arrived at a waiting shed and rested there for a while (7:10 am). We passed by some rice fields and constantly asked people directions when we meet one along the trail. Farther down, we passed by a short hanging bridge (7:32 am). Then went back up to another rice field area by the mountainside. The trail on that part was confusing as there were many rice field earthen walls to walk on and sometimes leads to a dead end. We decided to go down to the river and see the hanging bridge and a small waterfall instead. From the river we went up again to a trail by the mountainside and into another rice fields (Terraces) where we saw a farmer. We introduced ourselves to her and asked directions going to Tili ti Nuang Falls. On our course of conversation, I asked her why most of them usually regard people coming to their place as "Gold Hunters"? She explained that at some point in time there were some people who visited them and planned to make an irrigation dam at their place particularly at the river. But then these people were unexpectedly went digging and searching for other things (treasures) which were not acceptable. She added, back in her college years, she was once enrolled at one of the schools at San Fernando City, La Union. "Ala sige ngarud tatnu makita da mut ti pintas ti ayan mi" (okay, go ahead so they can see the beauty of our place) she ended. We thanked her and went down to see the cascades by the river and decided to take a dip. Along the river, we walked upstream passing by a river bend and just few meters up was the Tili ti Nuang waterfalls. The pools of the waterfalls were deep and looked like there were some crevices down there. Few meters upstream of the main cascade was a left undone hanging bridge. It was not yet finished and i think it was still the same thing i saw when i came there last year. And now we had to get to San Gabriel. Few meters down the base of the unfinished hanging bridge was a trail. We walked on this trail leading to patches of farmland and then lost trace of the trail. We went up and found an off-beaten trail going up the mountainside then lost trace of it again until we came upon a wooden small house with smoke coming from the wood furnace below the house but there seemed to be no one around (10:27 am). 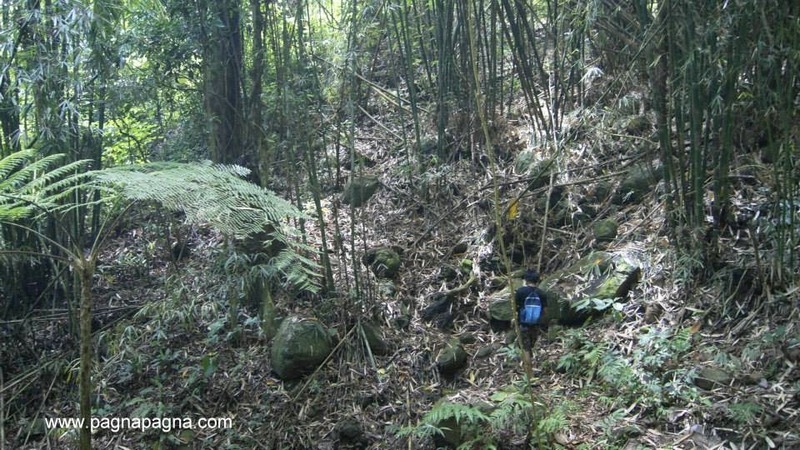 We continued walking going up and lost trace of the trail again, passing some patches of mountainside gardens of ginger until we came upon another trail where along it we met an old woman whom we asked directions. She was a friendly one who smiled when she speaks and said that just go on that trail, you will eventually see the road. 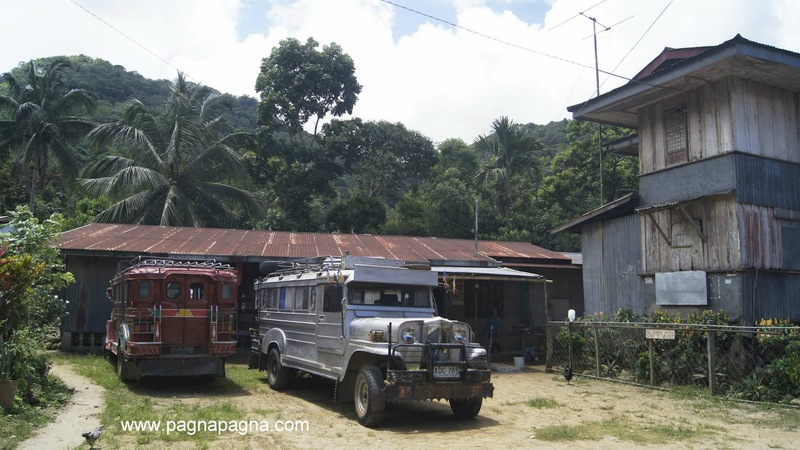 We thanked her and went on the trail which eventually led to a residential area (Barangay Apayao). There we went to a store to get something to drink (10:59 am). The store owner was a little bit skeptic about us as we were strangers. With proper introduction and smiles we eventually had her confidence of trusting us. 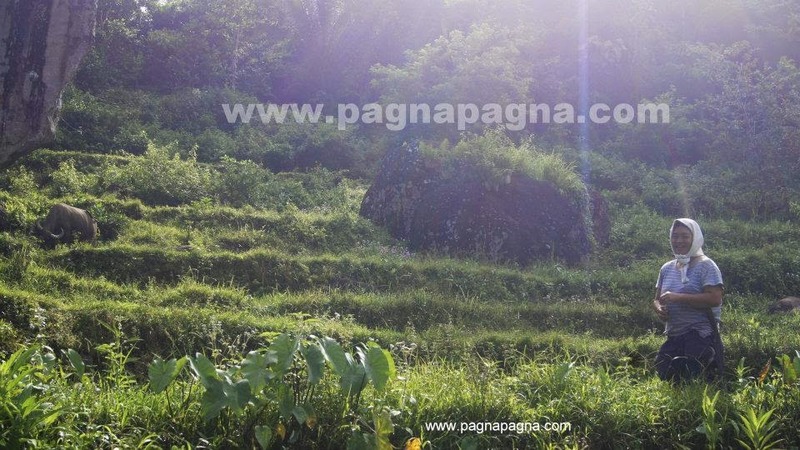 (Perhaps, we should not only log-in to the municipality of Bagulin but also with that of San Gabriel. As we were crossing the boundaries of the two municipalities). We had some 1.5 liters of warm soft drinks as she said that they do not have a refrigerator. We also bought some crackers "kropek" where she gave us a plate of vinegar to dip on. After some few conversations, we paid and went to the road nearby (11:19 am). At the concreted road, we walked and passed by the welcome marker of Barangay Apayao at 11:49 am until we took a rest at a waiting shed by 12 noon. We had our little packed lunch there and rested. At 12:25 pm, we continued walking, passed by an Elementary school at barangay Amontoc (1:39 pm). At around 2 pm, we arrived at a place called "Siwsiwan". 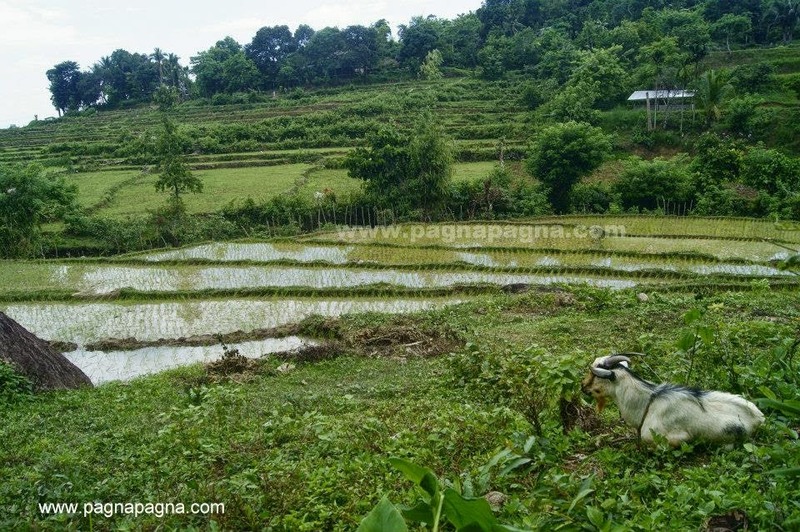 Crossed the rice fields through a concreted pedestrian foot path that led to a main road. At a store nearby, we filled our bottle with drinking water. At the "Siwsiwan" area of barangay Amontoc. 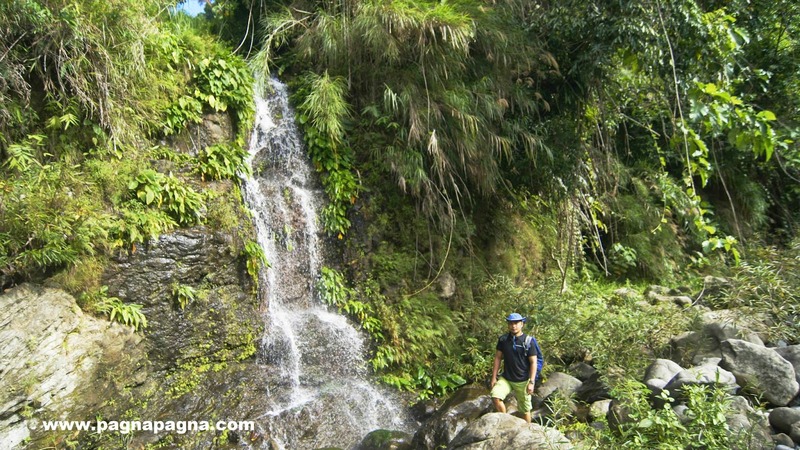 We continued walking, and eventually arrived at Tangadan Falls at 3:25 pm. Tangadan Falls, finally but not yet finished. Tired and sweaty, we departed Tangadan Falls at 3:40 pm. Passed by the mini-irrigation dam at 4:45 pm and finally arrived at a waiting shed near Duplas Barangay Hall of San Juan, La Union at 4:58 pm. While we were at the waiting shed, it rained. Few minutes later we rode a tricycle going to downtown San Gabriel, La Union and eventually rode a jeep going back to Home Sweet Home but realizing, i forgot my blue hat at the waiting shed (Unfortunately, I lost it). 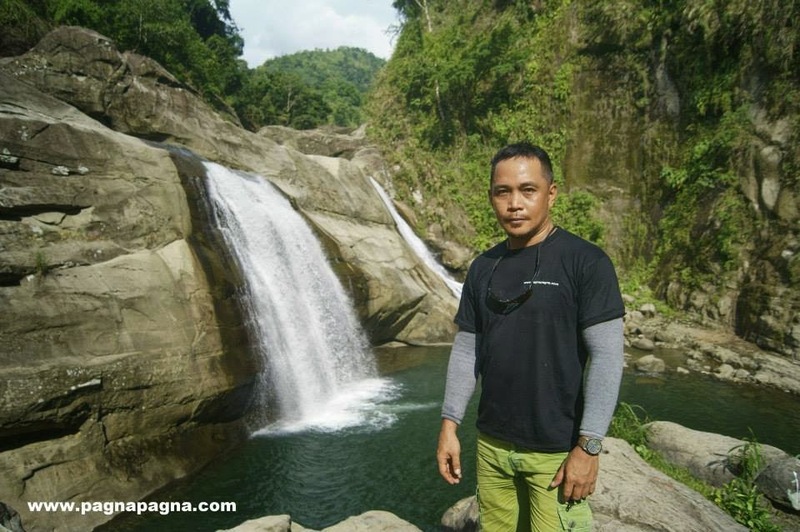 Tangadan Falls had a significant increase in terms of tourist arrival. The local government is now constructing Public Toilets and there is also a rumor of them putting up a viewing deck. Along the trail (Via Duplas) there are sari-sari stores on sheds where you can have stop-overs and buy munchies and drinks (on some days but mostly on weekends and holidays). They also have a spring flowing (on a hose) where you can get water. If you like the peace and quiet, try going on weekdays where there are fewer people going. Below is a year 2015 (Month of March) Video Clip of the place. 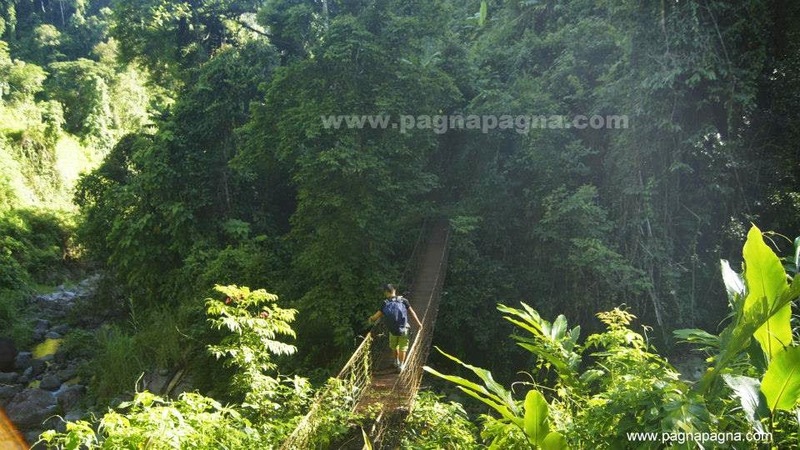 Walk your way to the Hanging bridge and cross the river with the said hanging bridge. 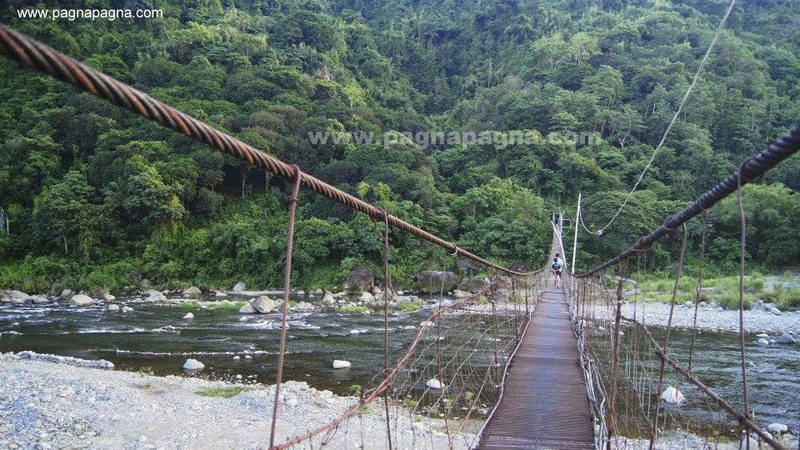 At the other side of the river, there will be a waiting shed located at the end of the hanging bridge. Just follow the footpath or trail going up, it will lead you to a cemented road above. Passenger motorcycles are parked here, you may now hire one of these motorcycle (with a driver) to take you to the “drop-off point” at Barangay Cardiz. Wen mayat... nakitak ti facebook mo ket mas-adaddu gayam ti napnapanam mun ngem kanyak. addaak pay lang ti exploring ken discovering stage.